I used to have smooth skin and nice hair and all of a sudden my hair has gone matted and skin has pimples and blemishes all over and I think its due to something spiritual because I look after my skin and hair but Ive given up on it now Im going to but an appointment with my dermatologist but is there any spell or anything I can do I washed my face with chinese wash yesterda and there seems to be slight improvement is there anything else I can do? Re: My health is deteriorating and I dont no whats causing it? Well, I would definitely wait until you speak to a doctor. Your problem could easily be hormonal or glandular since it involves your skin and hair, or any other number of things. Get those tests run before freaking out about the possibility of it being spiritual. You can, of course, work with Healing products in the meantime to help your body work through whatever is causing the issue. Dr. Jose Gregorio Hernandez is great for helping people find the right diagnosis and treatments, so you may want to petition him. How do I get a reading Im all the way in the UK and only have a mobile phone? Many AIRR readers will do email readings. whats an AIRR reader? Im really not up to date with all this. You mean on the radio? how do I apply? AIRR = Association of Independant Readers and Rootworkers. These are professional workers who have been peer reviewed for training, skill-level, and ethical standards, so by hiring an AIRR worker you assure that you are getting an authentic practitioner that will not rip you off in any way. You can browse through, and see who offers email readings, and then book a reading with them. This is not exactly hoodoo but a helpful idea for skin, apple cider vinagar is amazing for the body and skin, has to be the raw kind ( not filtered) the list of benefits is over the top could be worth looking into as a supplement to add to the diet as we age. Hoodoo products I like healing and blessing I use em to gether when sick or helping the sick on a white figure candle and healing herbs. Wish the best of luck! I have been suffering from heart problems for about 13 years and I am very sick and it really gets me down. I would like to know whether a mojo bag for health would really work in my situation? I seem to have luck with mojo bags and honey jars. I think that you need to get a reading to assess which products would be best for you. If you are very sick, I would highly advise that you keep going to the doctor, and you may want to work with Dr. Hernandez and ask that he guide you towards a doctor that can help you. Yes a mojo bag can help you, but that still should not replace the obvious of going to the doctor to help you. I am at the Doctors office all the time. Your suggestion for Dr. Hernandez products sound very good. Thank you so much! See this page and scroll down there ten or more herbs and roots to work with. Some have petitioned the Sacred Heart of Jesus for heart conditions. Lucky Mojo has oil, incense, powder, bath crystals, and a vigil candle dedicated to the Sacred Heart. You could also light a Healing Miracle candle, which has a picture of Mother Mary. Hello I come looking for insight and clarity. A friend of a friend was recently in a motorcycle accident. He was riding down the street late at night and was hit by a deer. He is currently in the hospital in critical condition and remains on life support. While his body continues to fight strong, he has suffered from severe internal bleeding along with broken bones, damaged organs and both of his legs were amputated, mid-shin and mid-knee respectively. I hardly know the guy however something inside me urged me to aid his family and friends in some type of capacity. I donated money to the family, however, I don't feel that it's enough. 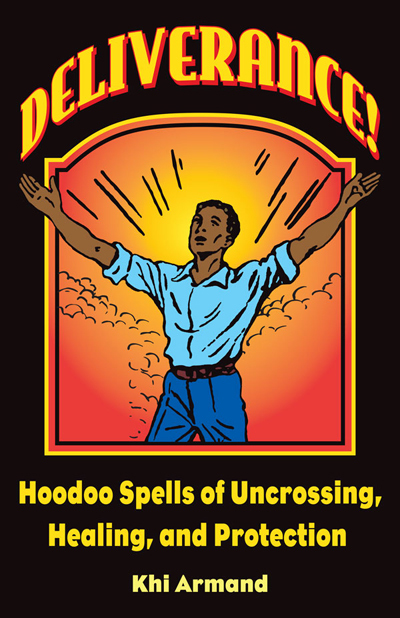 Knowing what I know and what I can do in terms of hoodoo rootwork and magicks I'm compelled to call forth the aid of the holy spirit, a ritual or even a Saint. I am quite aware that these type of tragedies are beyond our control and this type of work can only do but so much. His family and friends are praying for a miracle every hour to every day and I would at least like to help with that. God willing, if he wakes up his life may be different from what he once had but I believe everyone deserve a second chance at life and to build anew and to reclaim past dreams and glories (i.e. he was a soccer player and college athlete). Thank you for your time and any recommendations you all might pass along! Hi Pink, the first thing that popped into my mind was "protect him". Don't know why ... perhaps the random, weird, unlikely nature of his accident. Are you feeling similar thoughts? Put a prayer request in for the injured friend at The Crystal Silence League, http://crystalsilenceleague.org/ . Thank you for your suggestions! Sadly the young man has passed away. I am glad he is not in anytime of pain anymore. I had my son April fools (baby) I had some complications his cord was around his neck but was okay..he had a super high level of jaundice didn't find out til I had to take him back to the hospital for not eating and drowsiness.. He loss some weight,was in distress,couldn't do normal infant things and had to be poked and probed for testing..luckily no brain damage and his jaundice level went wayy down also every test they've ran so far have been negative but they are still trying to figure out why he's not displaying certain normal infant behavior.. I'm just ready for my baby to be well and come home out of nicu at by the time we move into our new home.. Sometimes it seem like the doctor knows what she doing other times I want her dismissed..
What saint can I petition for his health and a speedy recovery? What can I do daily to help and help the doctors find what's really causing the problems? Oh I am so very sorry. You poor thing. And your little angel baby. I pray that all works out well and that your little angel fully recovers. I honestly don't know where to put this situation, so please forgive me if it's in the wrong section. I have a friend who slipped on ice while at work and cracked his shoulder. So he hasn't been able to work since February, employer eventually fired him and are making him jump through hoops in order to get the surgery that he needs. Because of this he has had some depression, but until the shoulder is healed he won't be able to work. What, if anything can help his situation? He needs a healing, plus a job. I would really like the employer to allow him to go ahead with the surgery. The first doctor suggested surgery, but the employer wants a second opinion...basically a cheaper route. First, he needs an attorney IMMEDIATELY. I see 3 or 4 potential lawsuits here. But, seriously, he needs to sue this employer. Thank you Miss Aida, I am pushing him to contact an attoryney and I am making a list of items to purchase. Hello, I hope I am putting this in the right place. I am a newbie so be gentle. I m so sorry to read this. Have you considered seeking a second opinion from another physician? Yes, that Mojo hand can help. Wishing you the very best and praying that you become pain free and walk again.